We’ve released a new update for Barcode Scanner for BlackBerry® 10 Smartphones. The new update fixes minor bugs and improves the overall performance of the app. The new update also adds a new type QR Code content recognition: BlackBerry World™ links. After scanning a BlackBerry World™ link you now have the option to open the link directly in BlackBerry World™. Another improvement is that the app now directly starts in scan mode. 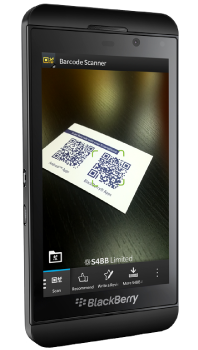 Scanning a barcode or QR Code is now literally a single click away. Just tap the app icon and aim your device at the barcode or QR code. Contact info: save to address book, or directly compose an email or call phone number. Calendar Event: add event to calendar. URL: open website in browser. Phone number: call phone number or add to address book. BBM™ pins: invite to BBM™. Geo Location: show location on BlackBerry® Maps or navigate to that location using BlackBerry® Maps. Plain Text: copy to clipboard. WiFi: copy SSID or password to clipboard. BlackBerry World™: open BlackBerry World™ links directly in BlackBerry World™. Recognized barcode formats: Aztec, Code 39, Code 128, Data Matrix, EAN-8, EAN-13, ITF, QR Code, UPC-A &UPC-E. The new version of Barcode Scanner is compatible BlackBerry® 10. A slim version of Barcode Scanner is also available for BlackBerry® OS.